Walking holidays are lots of fun for both novices and the more seasoned walker but - if you're organising your own trip - what's the best accommodation option? Camping is cheap but doesn't appeal to everyone and can be pretty miserable when it rains. Bed and Breakfast Accommodation (B&B's) can be surprisingly expensive and/or of variable quality. Self-catering can also be expensive and variable in terms of quality (of accommodation and of the equipment provided) and not be economic for shorter trips. A caravan might solve many of these problems but not everyone wants the bother of towing a bulky caravan along narrow, windy roads or has a powerful enough car to do so. So what about a Motorhome or Camper Van? Does this offer the best of all worlds? With the help of The Explorer Group, we spent a week checking out a vehicle from the Elddis range - an Autoquest 115. Ease of driving - how easy was it to get the vehicle to a camp site? 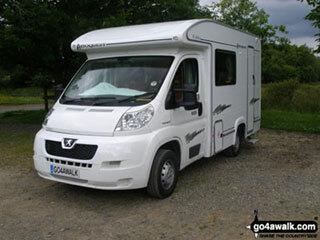 Choice of sites - is it easy to find sites for camper vans? If not walking directly from the site - how easy is it to get the vehicle to the start of a day-walk and park there? Packing up and moving on - how easy was it to move on to a second site during the week? Cooking, bathroom, drying facilities - how self-contained is it for a week's holiday? Only the super fit walk on every day - so how comfortable is the camper-van for leisure time, reading, cooking, little bit of work for two adults - particularly during inclement weather? Obviously, it is impossible to cover every aspect in a single week but we did endeavour to test as much as possible . . .